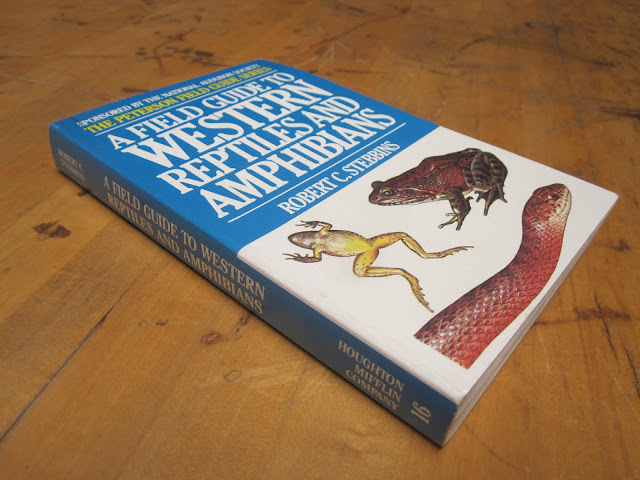 Over the past 30 years, I have owned about a half dozen copies of A Field Guide to Western Reptiles and Amphibians. One of the books with the greatest influence on my life, Mr. Stebbins taught me the merits and value of being an ethical amateur naturalist. With this book in hand, a stroll in a suburban backyard can be an expedition. Rather than photos, Stebbins illustrated all the plates in gorgeous detail. "To attempt to render a scientifically accurate drawing is time consuming... It becomes necessary to draw them (scales) all, faithfully recording size, number, shape and arrangement to obtain a satisfactory result." Indeed, the Western Blind Snake is illustrated with a single scale between the oculars, while the Texas Blind Snake shows three scales between the oculars. In these days of wild climate change, determining the accurate distribution of reptiles and amphibians is more critical than ever. If the gila monster is found at the east if the 117 degree west longitude, this is important information about how microclimates are changing and effecting wildlife therein. Websites like California Herps will play an increasingly important role in determining changing wildlife populations. A crowd sourced wild animal distribution database would be monumental. Modern, revised versions are out there, but I prefer the original to capture all of Stebbins' conversational zeal. The above pictured book was purchased on eBay for $3.50 including shipping.